rocky's bru: Assalamualaikum, Hard Rock Cafe! Updated: Here's a Ku Nan classic for 2014: Only alcohol-free Hard Rock Cafe for Putrajaya, says FT Minister. I really can't tell if Ku Nan's serious or just poking fun at Aseh Che Mat for pre-empting him, the Minister in charge of Putrajaya. That was his 2017 classic. If you have forgotten, read h e r e.
The first time I heard Ramli Sarip opened a show with "Assalamualaikum, Kuala Lumpur!!!" instead of "Are you ready to rock!!!? ", I couldn't decide if he was stoned or tipsy. But the rock star doesn't need single malt or grass to be intoxicated. Passion for his music is enough to get him high, he once told me. Many of his fans are like him: good, law-abiding people. 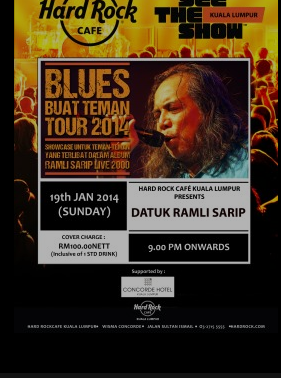 Papa Rock's first show for the year will be held this Saturday Sunday in Kuala Lumpur at Hard Rock Cafe Kuala Lumpur. p.s. In case you missed the chatter, Hard Rock Cafe will NOT open an outlet in Putrajaya because Hard Rock Cafe serves alcohol and offers unsuitable entertainment, or so says Putrajaya Corporation chairman Aseh Che Mat. The man must have been smoking something because that was not what he had said just the day before, h e r e.
What about opening one in Shah Alam or Kota Baru. Lets call it Kafe Batu Keras. Sheesh. What utter rubbish is this nonsense with the religious gamuts? You do not do sinful stuff at Hard Rock as opposed to the so called massage centres of Selangor, which clearly violates the licence conditions. Something fishy in this case. Tutup lah Shangrila Putrajaya dan Alamanda woi ... ada restoran jual arak dan ada cinema ciptaan Yahudi. Apa bodo si Aseh ni, dia ingat Putrajaya ni bandar suci ke? Kelañtan got arak. Selangor ada kilang arak. Jadik apasalah ada hard rock kat putrajaya. Umno will get PAS vote definitely if open in putrajaya. His memory surely is lapsing. Dementia? Or the "flip-flop" is the order of the day. These people are full of religiously Islamic-do-it, that they forgot their are others of different faith. Why is it that everything has to be forced down our throat that Muslims here can't use their own brain. This is beyond comprehension!!! Heyyy what's wrong with Hard Rock Cafe? It's a pretty cool place full of rock nostalgia and for rockers to chill out. We're not praying to Satan or anything? Why is it wrong to have an HRC anywhere, have the detractors been to HRC? HRC's cool!! It's got a Harley on top! And it can feature our local rock artists too, like Wings, Search and Butterfingers. They're not morally corrupt! No casinos in JB! Read my lips! Let Singapore benefit from all those China Chinese who are anxious to make or lose money on the gaming tables! Such materialistic issues are not for us. We much prefer the tried-and-tested ways of rent seeking, subcontracting, unauthorised "mark-ups" and such like. Whats wrong with Pemuda UmNo all up in arms over Carlsberg or Tiger Beer? A can of beer or two wont harm anyone but ease the karaoke session. Talk about religioin as opiate so that the ruling class can steal.. Heaven is reserved for UMNO faithfuls. The rest of us are condemned to hell. What is next? You can break the law as long as you support the government and behave like a clown.